Last year at this time, our team was energized. We were heading into the anniversary of Jodi’s disappearance with an organized walk in Mason City. Many from the community responded, even showed up to walk for that matter. We figured it was a good way to draw attention to Jodi’s case because, after all, 20 years is long enough – we wouldn’t see 21 years. We approach this anniversary with a loss. Not only is Jodi still missing, we just seem to be losing the battle. Yes, we know trying to help solve this case is a tall order. But does it need to be? You’re reading this and don’t you think the person or persons who committed the crime could possibly be reading this as well? Chances are…yes. We put a video together many years ago. It still fits to this day – we won’t give up and we haven’t. And the person who did this is most likely right here with us. So please watch the video and help us continue on the road to find Jodi. This video is a good peek into more upbeat, angry and motivated times. Our team has had an up and down year. Life has simply gotten in the way of narrowing in on the best leads to find Jodi. Our members have been through, personally, some of the best and worst times life can serve up within the past year. We come to this anniversary with a void – nothing to report. Just as many anniversaries have passed without a big headline or a new development, this year is the same. And we’re getting awfully tired of admitting that. Years passing with no new developments, no decent leads and no progress wear heavily on our team. 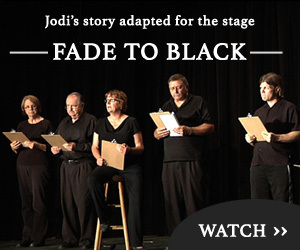 We can’t imagine to begin to feel how it wears on Jodi’s family and friends. It’s frustrating. Yes, we still get some leads here and there, but they have dropped off significantly. We always get focused and a bit re-energized during an anniversary because people start to ‘remember’ things. They start to recall where they were, who they saw, what they heard. Those recollections are the most valuable things we’ve got at this point. So we ask you to please come forward if you recall a slight detail that seems unimportant. We’ve said it before, that small detail could be the one thing we need to solve the case. This year began with a new Police Chief at Mason City Police Department. Nine months before Jodi disappeared, Jeff Brinkley began his career in law enforcement in Ames, Iowa in March of 1996. Now he’s Chief of MCPD. Brinkley is the fourth chief to be in charge of the Mason City Police Department since Jodi disappeared on June 27, 1995. That’s a lot of changing of the guard. The news is bittersweet. It’s great because it’s a new set of eyes and ideals that can focus in on the case and bring new perspective on a case that has been stagnant for years. It’s a disadvantage because the Chief has not read the case file, so he is behind (but he tells FindJodi.com he plans to read every page). Our team has reached out to Chief Brinkley and have offered up to help in any way we can with the case. We hope our relationship is stronger than it’s been before so we can all experience the same end-goal: to find Jodi. Our team uses a team collaboration software to share leads, information and compile our information. It’s a monthly fee of $37 after our non-profit discount. We haven’t received a donation in several months and without financial support, this tool will go away. (Update: We received a $50 donation today from someone who always comes through for us – you know who you are and we appreciate it). Travel expenses, research costs, software, website costs – these are all things we cover ourselves. So we again make a plea to readers, any donations can help us continue our mission. If you’d like to donate, please do so here. Your donation is tax-deductible and we’ll send you a receipt. But regardless of the donation, what we really need is for people to start coming forward. Too much time is passing to clearly remember events for people who were around Jodi back in 1995. If we don’t archive and study this information now, it’ll be gone forever. It’s time for our team to get re-energized and work some new leads. We hope you can supply us with those leads. So I’m making a plea to those out there to A) let us know what you’d like to see our team do; where should we focus our efforts? And B) send us information that you may not have sent in. Remember, the smallest tip could be the biggest one. What should we be doing? Where should we be looking? Who do you think should be looked at? What do you know about the case? Thanks for your support and help in finding Jodi. If you’d ever like to send us information, you can do so here. If you want to remain anonymous and send us a message you can do so here. You can call us at (970) 458-JODI and leave a message for us. I think the new software makes it difficult for people to engage. Not sure why, but that is when people stopped commenting, etc. Hi Miriam: Thanks for the message. The software I was referring to was what we use internally as a team. As for what you’re mentioning, are you talking about the forum? That has been active for years and we’ve seen a lot of dialogue on it, but that too, has dropped off. If there are any issues, I hope readers would reach out so we can fix them – but there don’t appear to be any issues at this point. Thanks again. I know this case for past 6 years and following it whenever i remember…its so sad that this young beautiful women life taken soon…i beleive unless the person who did this comes foward and says something its quite difficult find out , but i beleive it will be some how solved.